Welcome to the first Free eRead-a-thon challenge! You have to be a participant and signed up in order to participate, but if you haven’t signed up there’s still time! Food often appears in some format in the books we read and therefore we have a recipe challenge! There will be two options. Option 1: Post a recipe from the book of your free eread that you’ve come across. Let’s say a character bakes a batch of chocolate chip bacon cookies. You can post a recipe for it. Option 2: This option allows you to create a recipe or pair one with the book you’ve read or are reading. Reading a cheesy love story? Maybe macaroni cheese might be the thing. Book is a sinful delight? Pair it with a sinful dessert or dish. There are no limits. Your post must include: Book’s title along with the author’s name. If you are using someone’s recipe (for example, you got a recipe from All Recipes), credit them and provide a link to the original source. One participant that links up their challenge post will win their choice from the prize list. Challenge will close on Wednesday, August 14th at Midnight EST. Winner will be chosen by random.org & you have 48 hours to respond or I’ll pick another winner. 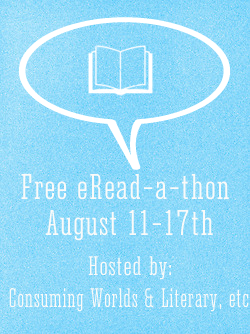 Mark Your Calendars: Free eRead-a-thon is coming! Now this is a cool challenge! The book I am reading now is a good choice for this challenge…but it would be about seafood and I hate seafood! blech! Could I do a drink recipe?? AlyssaZ recently posted…Free eRead-a-thon Goals!